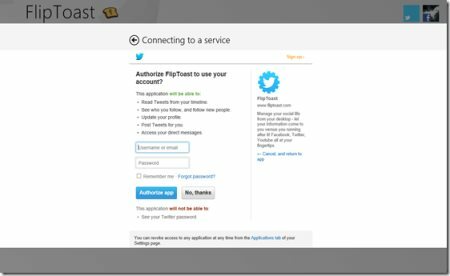 FlipToast is a free Windows 8 Social Networking App that will always keep you online and let you connect to your social networking group on Twitter and Facebook. Connecting with your friends on two different networking sites, a single mouse click is so easy and it won’t let you miss a single post or message from them. 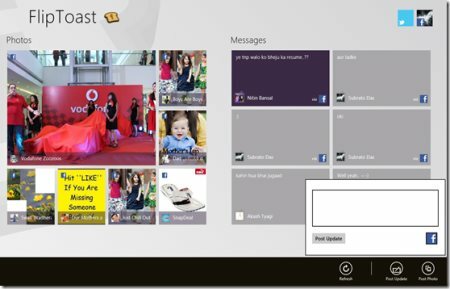 FlipToast Windows 8 app gives you the provision of adding your Twitter & Facebook account and you can have your friend’s post messages and other upload-able things on FlipToast. You can update you posts, tweets, like a status, comment, on Twitter & Facebook directly from this Windows 8 social networking app. Just sign into your account and have a shot of your daily posts, notifications, followers, messages, events, photos, birthdays and lots of other things from your online social life. In addition to that, you can check other posts which you skipped lately. Above is the interface for Facebook, you can easily check your Today’s posts, notifications, photos, birthdays etc on a single interface and can pace up with your friends and treasured acquaintance. And above, is the sign up interface which will help you to app up an account at the same time when you are doodling with your Facebook account and rushing through your friend’s daily updates. Just sign in to your account at this Windows 8 social networking app and stay logged in always to your social group’s upcoming tweets and posts. Also, check out our post on BIGFLIX: Windows 8 Movies App. Overall, you don’t have to just sit around and watch your friends nagging but you can also post updates and photographs you want and add your photographic memories to your social networking site. So, its pretty good to have a social networking site chunk on your desktop supported by Windows 8. 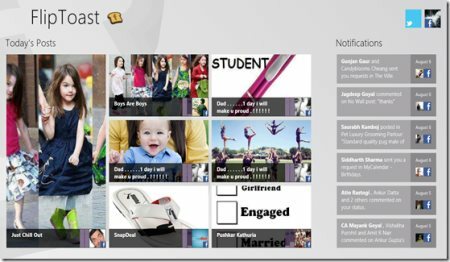 Go ahead and download this Windows 8 app available under the Social category.